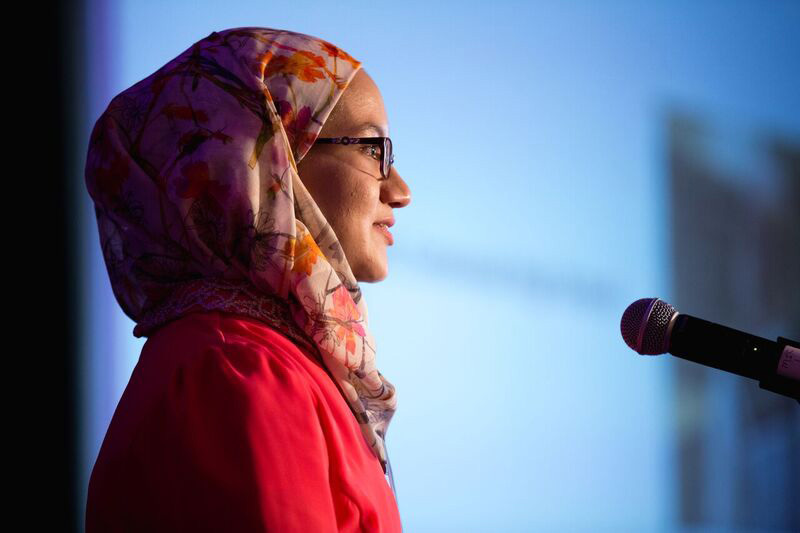 Called “an inspiration” by Children’s Defense Fund President Marian Wright Edelman, at the age of 8, Sara Abou Rashed wrote her first poem in Arabic and has been writing since. Born and raised in Damascus, Syria, in 2013, she moved with her family to Columbus, Ohio to escape the war. In 2015, just two years after learning English, Sara won the Ohio Poetry Association High School Contest. Sara is the 2015 Columbus City Poetry Slam Champion and the 2016 1st Runner-up. Her art and poetry have won several contests and have appeared in numerous books and magazines including: Clover, Common Threads, The Voice of Youth Advocates, and the America Library of Poetry. Some of Sara’s accolades include giving a TEDx Talk, getting nominated for a Pushcart Prize at 16, and performing at the Tenement Museum of New York. Sara aspires to work in public policy and foster dialogue on political art; she is attending Denison University, where she was awarded the 2016 Denison Book Award, pursuing a degree in International Studies and Creative Writing. Now 19, Sara is an “Arts Make Columbus” artist.